What do You think? They Say the same things "Yes i can program the board for your display"
The difference is in the chip they use - some have the Realtek RTD2660 chip, others have a VST29 which i haven't of and the third use the Novatek NT68676 found in some njytouch controllers. All of them will probably work fine. It gets hot at the 12V to 5V regulator but other than that it works ok. Check what's available on Aliexpress - often stuff is cheaper than eBay, and the controllers all come from the same chinese manufacturers. If you're willing to wait that is. Okay i have the intuos 4 large and the controller from italian seller!! I used a build, for a year or so, which was simply a laptop panel with a 2 mm thick glass cover, simply laid above an untouched Intuos4 large. (It was based on DonShole's TabletMod enclosure specifications - you can find some hints either on the tabletmod site, or on the Ponoko Market page that sells the designs - for laser cut). I still had some 5 mm of "free air" - only issues, the panel is dim, has narrow viewing angles and lacks colour saturation and contrast. You can always dismantle the Intuos4 (which has its share of advanced features, like those OLED displays and the Touch Ring - a bit finicky, that ) later. Okay i Will update with the results. Anyway in still really noob at choosing a protector for the actually screen. What screen protector or what i have to buy to put It by the screen and the Pen to not scratch my fragile 15inch panel?? And i dont know how to strip my panel, what this mean? For VIDEO to LVDS converter (for LCD panel) I recommend TSUMv29 or TSUMv59 or cheap VGA-only converters like this: >Aliexpress<. - old v29 - resolution selected via jumpers or uploaded via VGA connector by seller. - new v29 - USB for firmware update (each file for each resolution). - v39 - same as new v29 but support music and photos from USB. - v59 - same as v39 but also can play movies. - v56 - newest alternative for discontinued v59, should work the same way as older one. Main question: what is Your LCD model and do You have anything more for panel? For example LED backlight should work with internal driver, for CCFL backlight You need external driver saved from laptop or bought separately. Number of CCFL tubes matter, driver for 2 tubes won't work with single tube. Next - cable and connectors. It's better to buy special cable (often cost more than 10$) rather than play on Your own and destroy something. For short test LCD panel can work without anything protective on top. Pen with good nib shouldn't scratch screen. For regular usage scratches wasn't a problem. Real problems are: pressure (both from pen and hand) and removing dirt (water can flow into panel frame then corrosion will destroy something). Thus You need to add protective sheet of glass or transparent plastic and some spacing between plastic and LCD because plastic (plexi/PMMA/lexan/...) will bend when pressed. Plus, please carefully select material. Some types have high friction, drawing on that wouldn't be as nice as on other types. LCD panel are made of 2-layer glass (with polarizer, color filters, ...), light source (CCFL/LED strip), backlight diffuser, sheets of diffusers/lenses/..., electronic board (with connector for signal input), drivers mounted on flat flex and metal frame. Because Wacom works with EMR (electromagnetic) technology, electronic board and metal frame will block signal or cause interferences (search this forum for jitter). Tablet need to remove that parts but LCD wouldn't work without PCB. Only solution are to remove metal frame (strip panel) and gently twist PCB by 180*. In some cases PCB need extra shielding to reduce jitter but that's not my specialization. I prefer to get screen from TabletPC with integrated digitizer, then add two converters and simple case. What i have to do its Just to connect the edp cable and Power and HDMI , It Will work?? Or i have to connect other things. The panel that i have have this composition. Where i start to remove the metal? Aldo u Can see the Intuos 4 large . What Can i put between the Green board and the screen when i Will put the screen to that? A plastic plexiglass 1mm frame? Oh, You have eDP interface. That changes a lot (no LVDS). LCD and controller should work. I cannot see cable that fits both LCD and converter. Hope You have it too. First stack LCD on Wacom and test if it working. Pen should working without problems when LCD is OFF. When LCD is ON there shouldn't be much jitter in center of screen. Metal should affect Wacom only at edges and corners. If You have problems at center too - You may need to swap LCD screen to different model. How to remove metal: You need to remove whole black tape and few white pieces from screen. Then unscrew PCB (green part in panel) and try to remove metal without damaging flexible connectors. Metal should be held in place by plastic latches, sometimes glue. Without metal, bottom part of screen will contain only: PCB, LED strip, white sheet (light reflecting material) and plastic frame. You need to insulate PCB and LED strip from contact with Wacom. 1mm plexi or kapton tape are great decision. 2-3 layers of adhesive plastic tape are OK.
Other components (most of screen) are already made of plastic thus not need extra insulation. P.S. Part of metal frame may act as heatsink for LED strip. You should check temperature with and without metal. Overheated LEDs will burn quickly. I would like to know , how i can check the temperature for the panel?? 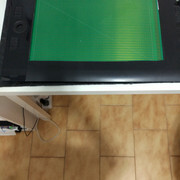 I had idea to put 1mm plexi between screen and wacom Green board .. It work so i keep It? So Wacom works. That's great. 1mm plexi is 1mm wasted space. You need to add 2-3mm top layer (glass/plexi) and let say 1mm gap between LCD and top layer. If Wacom works with extra few mm then You can keep 1mm plexi. If Wacom not work because of distance You need to reduce thickness and probably replace 1mm plexi with something thinner. Hope You understand. I can't show You the process of disassembling LCD panel. I can only search for that on YT and link You video. In both cases LCD projector need to keep only glass part and flex connections. You need to keep backlight unit and plastic frame too. So basically i disassembly the tape and the metal out of the screen then i try to straight the Little Green board and then? I still have to remove something? Okay so i have to put something above the screen. I was thinking about an ultra thin glass flexible, but It Will have to bè the clearest thing in the world, or i could have problem whatching the screen colors or the reflex Will hurt my eyes. Do u have some idea for the material? Also.. Can i just attach and put the LCD Screen to the Green Wacom Tablet thing? Or it will burn when the screen gets hot, so i have to put a distance in betweeen? So i can Just attach the screen with some alluminium tape directly to the wacom? Then i can do the same and tape the Little board of the screen too , to the wacom? What glass i can put above all? Maybe a strong think?